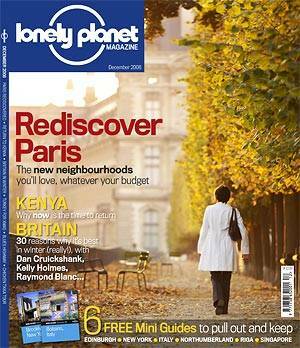 Lonely Planet has been purchased by the English news channel BBC, and now they are publishing a Magazine. I have purchase dozens of Lonely Planet guidebooks over the years and have been in a love-hate relationship with them ever since. I find it ironic, the reason I cannot read this magazine is because I am out traveling. They done me well in Central and South America and dropped the ball in West Africa where Roughguide.com picked it up. Generally, anyway I do it, I know as I talk there are people in this city walking around with a Lonely Planet in their hands. Lonely Planet is going mainstream; I expect them to go upscale about three notches as the numbers of Flashpackers and Tourists with Backpacks has dramatically increased in the last few years. The days of people bragging how cheap we traveled are ending for the old school Lonely Planet bunch like myself. You never know, maybe there is room for a new generation of guidebooks, I believe there is room for a new genre. I need a critique, Ash you are in England, I need to hear some noise.